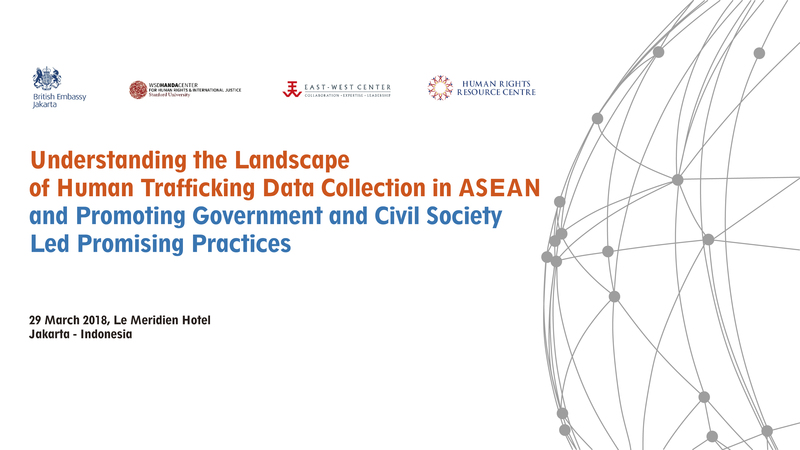 The Human Rights Resource Centre (HRRC) and the WSD Handa Center for Human Rights and International Justice at Stanford University (WSD Handa Center) will be launching the results of the study “Understanding the Landscape of Human Trafficking Data Collection in ASEAN and Promoting Government- and Civil Society-Led Promising Practices” on 29 March 2018 at the Le Meridien Hotel, Jakarta, Indonesia. The study aims to contribute to the development of initiatives for the effective implementation of the ASEAN Convention Against Trafficking in Persons, Especially Women and Children (ACTIP) by identifying and assessing positive steps and good practices in the region in the area of human trafficking data collection and analysis. This project endeavours to support the active efforts of the ASEAN Senior Officials Meeting on Transnational Crime (SOMTC) in combatting trafficking in persons in the region as well as the work of the ASEAN Commission on the Promotion and the Protection of the Rights of Women and Children (ACWC) and the ASEAN Intergovernmental Commission on Human Rights (AICHR) for the promotion and protection of human rights, particularly women and children in ASEAN. Ms. Jessie Brunner, Lead Researcher and WSD Handa Center’s Program Manager, will be presenting the highlights from the twin results of the study: (i) a policy report on promising practices on data collection from four countries in the region – Thailand, Cambodia, Indonesia, and the Philippines – with recommendations for possible regional policy initiatives; and (ii) guidelines on human trafficking data collection and analysis for frontline practitioners in Southeast Asia. This will be followed by commentaries from leaders in human rights and anti-trafficking efforts in the region and an open forum with distinguished guests composed of representatives from the ASEAN Senior Officials Meeting on Transnational Crime (SOMTC), the ASEAN Commission on the Promotion and the Protection of the Rights of Women and Children, the ASEAN Intergovernmental Commission on Human Rights, the ASEAN Secretariat, the diplomatic community, government ministries, and civil society organisations involved in the fight against human trafficking in the ASEAN region. SOMTC Philippines, the lead shepherd on the area of trafficking in persons in ASEAN, will be represented by Dir. Leocadio Trovela, who is expected to deliver the keynote message for the launch event. The study is made possible with the generous support of the British Embassy Jakarta and the East-West Center. Copies of the report and guidelines will be available at the websites of HRRC (http://hrrca.org/) and WSD Handa Center (https://handacenter.stanford.edu/). ACTIP, ACWC, AICHR, ASEAN, Events, SOMTC, WSD Handa Center ACTIP, SOMTC, WSD Handa Center. permalink.